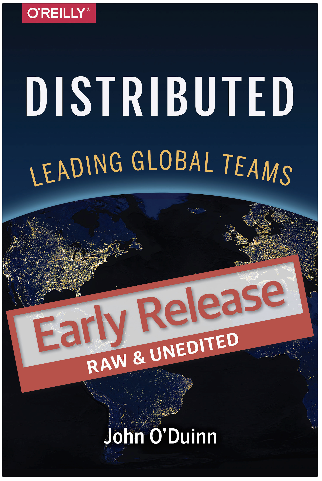 “Distributed” Early Release #8 is now publicly available, about 6 weeks after the last EarlyRelease came out. This ER#8 includes a significant reworking and trimming of both Chapter 1 (“The Real Cost of an Office”) and also Chapter 5 (“Organizational Pitfalls to Avoid”). I know that might not sound glamorous but it was a lot of slow, careful, detailed work which I believe makes these chapters better and also helps with the structure of the overall book. You can buy ER#8 by clicking here, or clicking on the thumbnail of the book cover. Anyone who already bought any of the previous ERs should have already been prompted with a free update to ER#8 – if you didn’t get updated, please let me know so I can investigate! And yes, you’ll get updated when ER#9 comes out. Thanks again to everyone for their ongoing encouragement and feedback so far. Each piece of great feedback makes me wonder how I missed such obvious errors before and also makes me happy, as each fix helps make this book better. Keep letting me know what you think! It’s important this book be interesting, readable and practical – so if you have any comments, concerns, etc., please email me. Yes, I will read and reply to each email personally! To make sure that any feedback doesn’t get lost or caught in spam filters, please email comments to feedback at oduinn dot com. I track all feedback and review/edit/merge as fast as I can. Thank you to everyone who has already sent me feedback/opinions/corrections – all really helpful. This looks VERY GOOD. I look forward to reading it. And congratulations on your writing so far! Is there an update on the release date of the book? Thanks for your interest in my book. Now that I’m settled back into San Francisco again, I’m back at book writing again. New schedule and dates still being worked out, but I’ll email you offline to chat in more specific detail.